In this section of Broker Brain, you can download all of your database data, photographs and attachments to a local file at any time. You also have the ability to quickly and easily remove all tasks assigned to any user within the system. 2. Check any or all of the boxes in the Download Data section and click on the Download button. 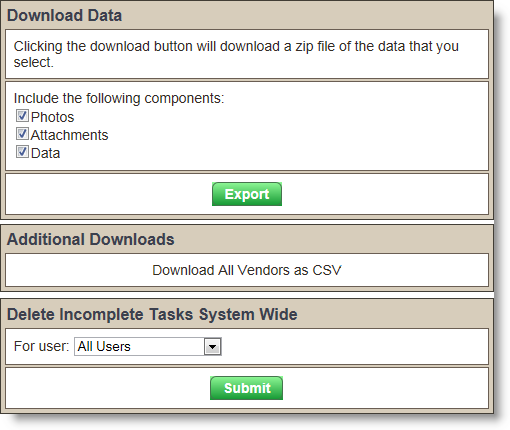 If you would like to download a spreadsheet of all of your vendors, click the Download All Vendors as CSV option and, in the pop-up that appears, follow the procedure you typically use for downloading information onto your computer. To remove all tasks assigned to a user system-wide, use the Delete Incomplete Tasks System Wide section. 1. Select the user's name from the drop-down box. 2. Click the green Submit button. If you were the individual who signed up for your Broker Brain account and you would like to authorize other users to modify the account's bill payment information, please call Broker Brain Support to enable this option.